I often find that preparing for a ride is almost as much of a joy as the ride itself. The slightly ceremonial laying-out of bibshorts, jersey, bidon and snacks the night before helps to mentally prepare for the task ahead. The selected attire acclimatises the brain to the likelihood of inclement weather, whilst the amount of food and water required conditions the mind to the degree of hardship ahead. When the laying out includes plus-fours, woollen tie, pipe and hip-flask though, you know it must be time for the many pleasures of The Tweed Run. 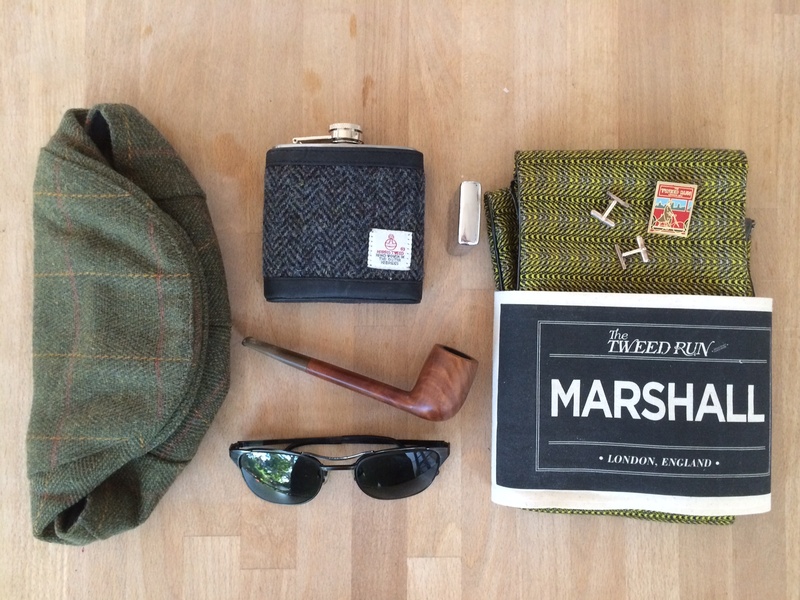 In fact preparations for joining The Tweed Run – “a Metropolitan Bike Ride with a Bit of Style” – begin many weeks earlier. A bicycle of suitable vintage often needs to be made ready (though, unlike at the Eroica events, this is not a rule), clothes need to found and checked that the moths have not ravaged them over the winter months. In the case of many facial hair needs to be grown and cultivated into some form of eminence, whilst for others international travel arrangements need to be made. It’s a long way from the first London Tweed Run six years ago. A relatively impromptu affair that began after founding organiser Ted Young came across a quantity of plus-fours in a Glasgow charity shop and posted an invite to friends on a fixed-gear cycling forum in the capital for a “Winter Dress Cycle Club Run”. 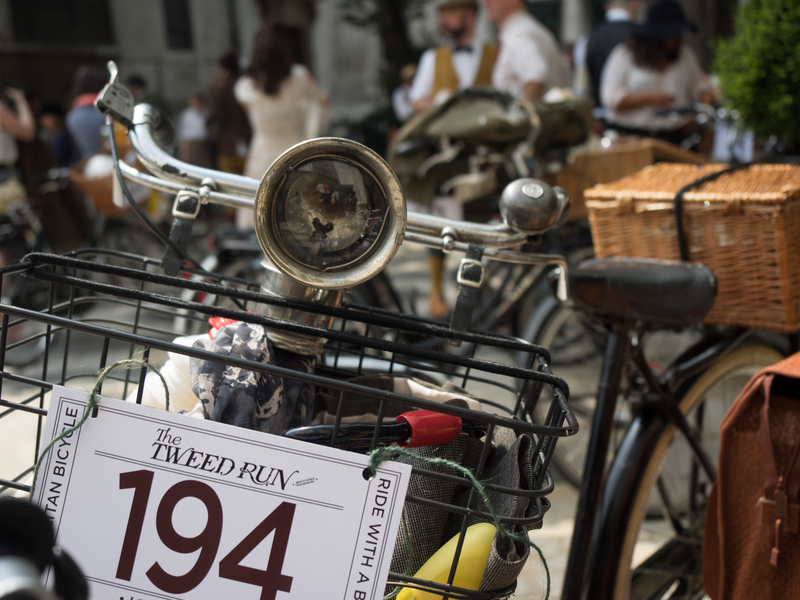 Two hundred and fifty people turned up and The Tweed Run was born. These days it’s a much bigger, infinitely more organised, affair with notable amounts of press following the event from all around the world. Ted confirms the difference, “It was just a rinky-dink thing that we kind of hastily organised. 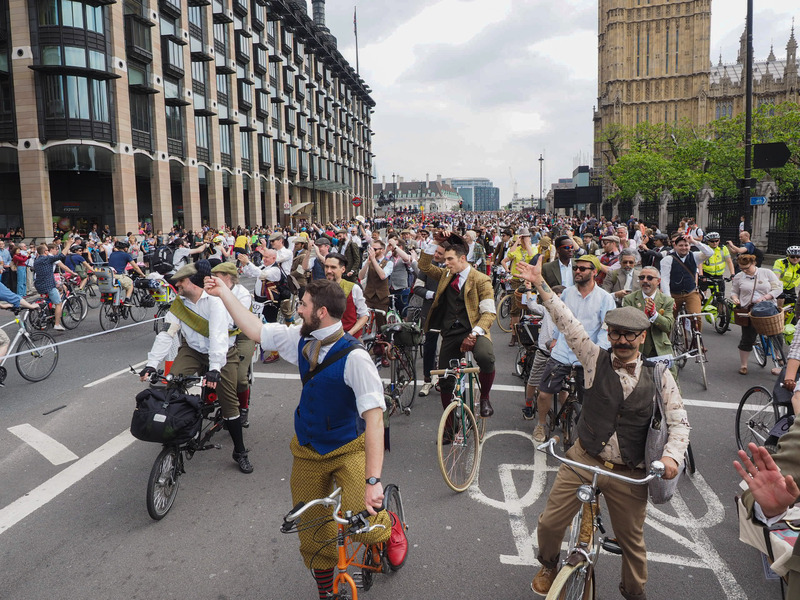 And now it has it’s own Wikipedia page..” The London Tweed Run now takes 7 months of part-time and 4 months full-time planning for Ted in the run up to the event. “I take a month off from it afterwards before starting again but it’s so complex now that..” His voice trails off as he perhaps remembers something else on the endless list of things that need to do before the start. 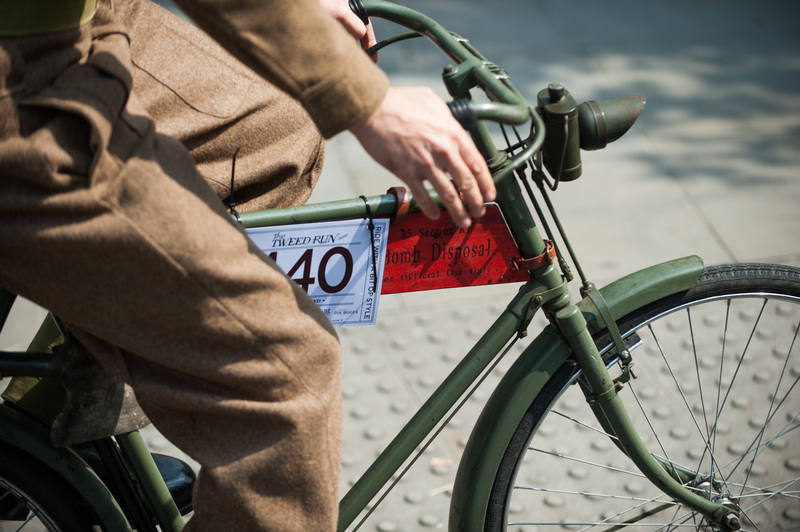 My involvement with the Tweed Run started last year when a friend asked me to help out with the marshalling duties. For marshalls the preparations begin earlier than most with a number of recce rides in the months before the event to learn and troubleshoot the chosen route. Although resolutely centred around the sartorial centre of the capital, St James, the route changes each year to take in different sights and to offer a new experience to returning Tweeders, many of whom use the event as an annual meet-up with distant friends. Having endured a number of freezing cold recce rides in late March last year I was glad to see that the 2014 event had moved a little later in the year from early April to May 17th, and, being a Blackheath-er these days, also that the route was venturing South of the River after staying North last year. Our recce rides confirmed that a much more twisty-turny, technical route awaited this year’s Tweeders and guaranteed that the marshalls would have a busy day herding the ride around the streets of the City, Southbank, Westminster, St James and Bloomsbury before finishing the 11mile ride in Clerkenwell. We would also have to contend with our 500 crossing the much bigger Space for Cycling ride, organised by the London Cycling Campaign, somewhere around Westminster. Final personal preparations involved cultivating a small moustache, which makes me look a lot like my grandfather, and doing some last minute fettling to my ancient orange Continental road bike. I say it’s ancient but it’s still a newbie compared to many of the bikes that would accompanying it on the ride. It would be fair to say that significant bicycle and moustache envy were recurring features of my day. This year the ride started from the courtyard at Somerset House. Officially it’s a 10 o’clock depart but marshalls were on station from 8am and some guests were already arriving. All the bikes were valet-parked in the street opposite Somerset House so we got an early chance to look over some of them and to chat with their owners as they rolled up. By the time the official photographs were done I had already met Gary, who was dressed in his grandfather’s original WWII Royal Engineer’s uniform with a matching Bomb Disposal Corp bicycle properly kitted out with shovel, gas mask and goodness know what else. Gary’s grandfather was a conscientious objector and refused to go into the infantry but gladly took on the much more dangerous role of bomb disposal. Gary showed me a old photo of him sitting on a couple of massive pieces of made-safe ordnance. As he tootled off to join the other Tweeders I took the opportunity to test ride a miniature Penny Farthing – a Shilling Ha’penny I suppose – with the permission of it’s owner Oliver Rudgard. Oliver works for Tyrrel’s Crisps, one of the commercial supporters of the event, and was leading a phalanx of Tyrrel’s riders who were handing out their wares along the route. Dressed mostly in velvet top hats and coats they had opted for some of the earlier historical references on show. 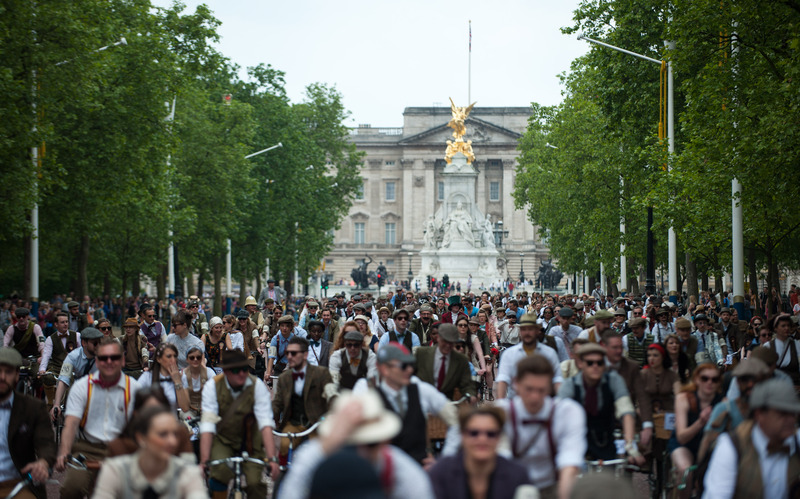 The time period that the Tweed Run encompasses is very loose. We were asked to explain it to a couple of American tourists later in the day and we arrived at “anywhere between late Victorian and the 1950’s”. There were pith helmets and frock coats, swagger sticks & spats, a smattering of WWII outfits, Eroica-era rouleurs, and all manner of summer dresses, stoles, throws and capes. Ted loves the fact that some people are dressing up for the ride but that others are into vintage in a big way and that some are just wearing what they wear “every weekend”. The hot sunny weather really helped, although those who had opted for full three-piece tweed suits suffered gallantly to maintain their stiff upper lips. At 10 o’clock sharp(ish) a bugle sounded and cries of “Tally Ho” resounded around The Strand. The 500 Tweeders and their reunited bicycles had attracted quite a crowd to wave them off as they circled around Aldwych and headed off past the Royal Courts of Justice, up Fleet Street, past St Paul’s and from there on towards the City. Before going too far though there was the small matter of the tea-stop at the beautiful surroundings of the Guildhall courtyard. I made good use of the full china service tea-stop (provided by the suitably named Good And Proper Tea Company) to fulfil two minor ambitions. The first was to climb aboard a full size Penny Farthing. Stuart Elliot’s ‘Ordinary’ – one of three taking to the course this year – was built in 1872 and qualified as the oldest bike in the race. Having struggled a little earlier riding the Shilling Ha’penny (the cranks turning as you turn is a very alien feeling to modern bike riders) I was less than confident about even getting up onto this monster but, under the watchful eye of 500 Tweeders and Japanese television, I managed to mount and, more crucially, dismount with all dignity intact. Apparently the official instructions for dismounting at speed used to be ‘look for a suitably sized bush and steer straight into it’! 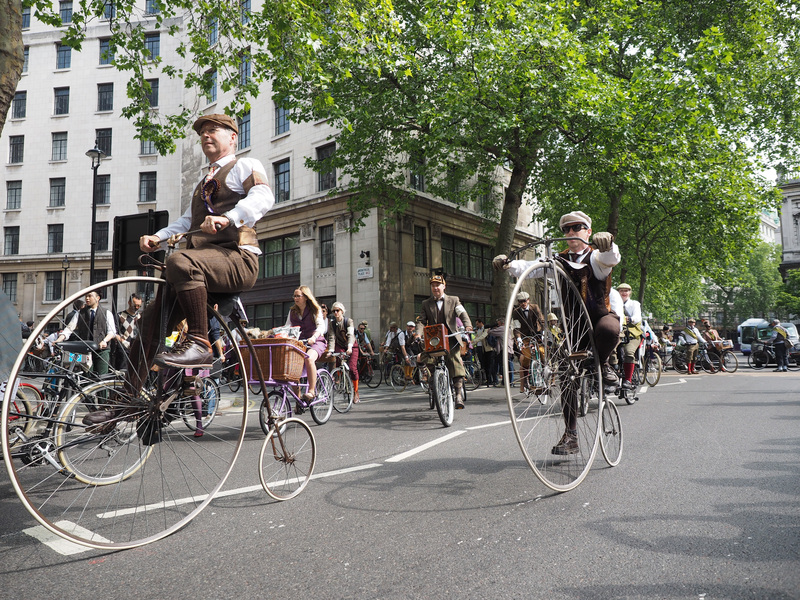 The Japanese seem to have taken the Tweed Run to their hearts more than most. 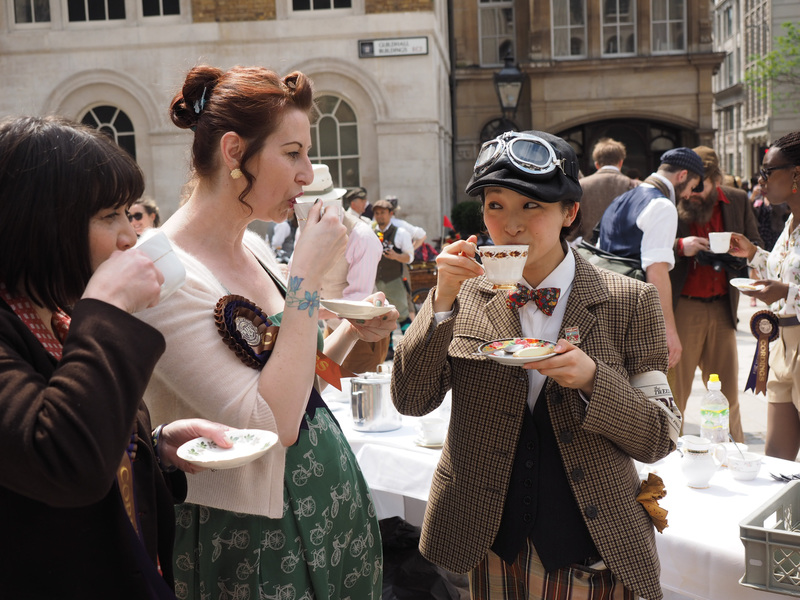 The Tokyo Tweed run is organised as part of their Fashion Week and the London Run had large numbers of visitors from Japan. “They asked lots of questions at the outset,” recalls Ted. “But now it has it’s own cultural attachments and heritage and that’s really cool. Each Tweed Run is different all around the world and you can get something unique from each one.” Italy was equally well represented, with two beautiful reproduction 1950’s racers standing out in particular. Ridden by Massimo and Paolo of ItaliaVeloce from Parma they brought some old-school paisano style alongside the more usual British fare. The second ambition fulfilled at the Guildhall was to smoke a pipe in the company of my good friend from the North, Matt Hooper. A veteran Tweed Runner, Matt and his wife Carol journey down from Leeds every year and often make it into the prominent photos due to Matt’s magnificent whiskers. I have owned a pipe for ages after being given one in jest by a housemate for a birthday present years ago but, despite sticking it between my teeth every now and again and using it to point at things as my dad used to, I’d never actually filled and lit the damn thing. Knowing Matt to be a pipe smoker of some distinction I sought him out and partook of a bowl. Once again I managed to pass the test without too much ridicule and I left Matt to his finish his pipe and remount his gorgeous 1967 Claude Butler Pathfinder as I got the Continental back to the head of the group for our resumption. British bikes were, of course, incredibly well represented. Hetchins, Roberts, Pashley’s, Moultons and Bromptons were in ample supply as were some less well known bike manufacturers (‘brands’ seems to be entirely the wrong word at the Tweed Run) like Milk bikes and Colourbolt. Ancient bikes from Sun and other lost marquees had also been dusted down, oiled and brought out for the occasion. Looking over the many variations of such a simple basic format was one of the main delights of the day. After the Guildhall the long train of cycles snaked through the City and the work of the Marshall’s started to get a little tougher. We had had it easy so far but as the streets got narrower and the procession got longer keeping everyone together became a tricky task. Shepherding the myriad tandems, Schwinns, Cargo-bikes, Flying Gates and even the occasional Pederson and a monstrous Tall Bike through the medieval street plan amongst double-deckers and black cabs is by no means straightforward and asking a cabbie with a ticking fare to wait for a third or fourth set of lights requires equal amounts of polite tactfulness and blind obstinacy. Thankfully the many marshall’s seemed to have both in great supply. 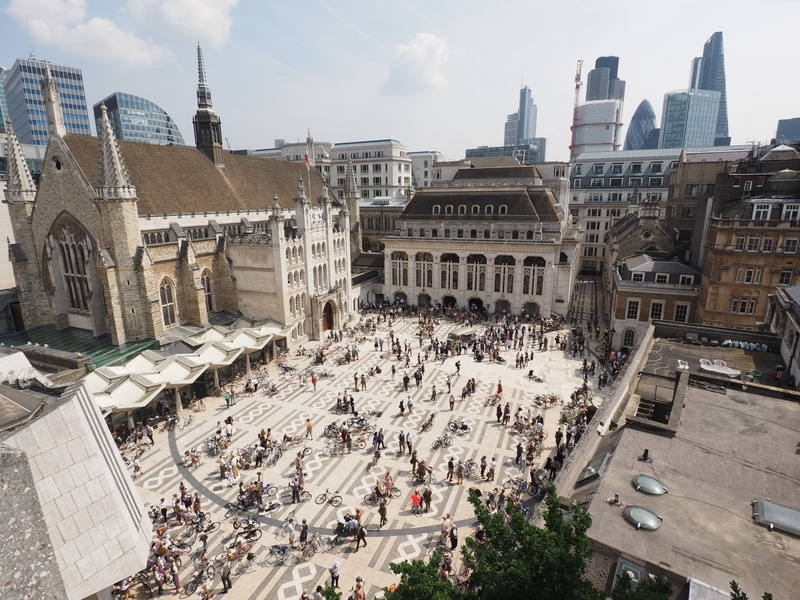 Following a spin through Leadenhall Market and quick once around The Monument the procession turned South and crossed the River Thames over London Bridge before turning through Borough Market and onto the Southbank. It was an excellent part of the ride with mainly pedestrians on the roads who were very supportive of the riders as they streamed past. Passing Shakespeare’s Globe, Tate Modern, the Royal Festival Hall and the London Eye, it also afforded the Tweeders a welcome bit of shade. As we turned our elegant cavalcade North again over Westminster Bridge we were treated to a magnificent cycling sight. Having bunched back up behind County Hall, the Tweeders now took up the whole of one side of the bridge at something like 12 abreast – a small sea of velocipedes in the heart of the city – but before us lay the veritable ocean of cyclists on the LCC ride. As we pulled up to a stop at Parliament Square caps were doffed, horns were sounded and pocket handkerchiefs waved at the estimated 10,000 who were taking part and countless LCC bells were rung in friendly return. The whole of Parliament Square was filled with bikes as we headed around the roundabout going North to Horseguards Parade and they streamed South and East from Whitehall to the Embankment. It was a truly glorious cycling moment. Next up was a quickly-paced jaunt up The Mall and the Queen-Mother of all U-turns directly in front of Buckingham Palace. Our route then took us into the spiritual home of the Tweed Run: St James. As we traversed Albemarle Street, Clifford Street and Savile Row many of the tailors took to their doors to greet us flowing past on our way to SoHo and the picnic stop in Bloomsbury. By now the traffic was thicker again and some Tweeders were beginning to feel the effect of the heat and the mileage. Keeping the group together got harder and harder – even with the assistance of the couple of police outriders whom we seemed to have seconded from the LCC ride – and the riders weren’t the only ones getting hot under their starched collars. The marshalls employed a time-trusted method for placating the odd belligerent taxi-drivers (and one Arsenal fan readying himself for the FA Cup final who seemed to take exception to the Tweed) by switching stoppers very minute or so and, if things didn’t improve, send in the secret weapon; Adam The Head Teacher. Adam’s unmatched positivity and charm, allied with just a hint of scholastic sternness, was too much for even the most irate driver to contend with and, after a request from him, they sat back and watched with renewed patience. By the time we passed the British Museum and arrived at Russell Square for the picnic, everyone was more than ready to take to the grass and rest under the trees. Alongside the hampers that could be ordered via the organisers, all manner of ingenious picnic stowage was brought forth and it all got a bit Wind In The Willows for a while with ‘cold turkey,cold ham,cold chicken,cold tongue,boiled eggs,sweet pickles,sausage rolls and goodness knows what else’ being produced from the array of wicker baskets, leather satchels and pellet bags. And of course flasks of tea, bottles of lemonade, cocktail shakers of gin & tonic and hip flasks of all manner of stronger stuff were also produced from the many-pocketed throng. In honour of the Continental bike I was riding I’d packed my hip flask with a bit of French brandy instead of the usual single malt and considered it a good time for a small reviver. The few bikes that had music systems on board playing jazz and big band tunes were stationed strategically around the loafing masses and an air of cultured repose replaced that of the restrained activity which had gone before. 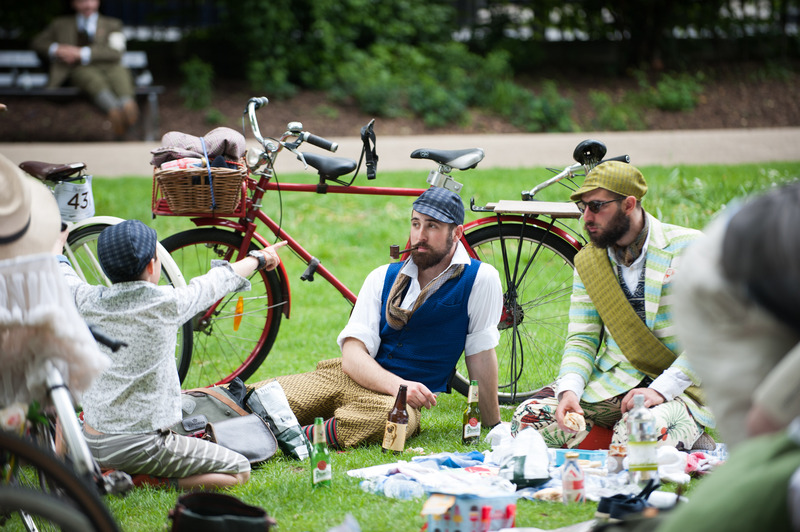 Those who still harboured some unspent vim took to the croquet field or to the ‘hat on the pigeon decoy’ game hosted by the Tweed Run’s other long-term supporter, Cordings of Piccadilly. The picnic was also the first real chance I had to catch up with Rachel and Rima since the tea stop. I’d seen them a couple of times on the route as they passed me and they seemed to be having fun. Their report back at the picnic confirmed this. As well as doing the meeting and greeting that the riders enjoy along the route, they had spent much of the second part of the run discussing far more ambitious costumes for next year. Mechanical peacock feathers for Rima’s bike were mentioned at one point: keep your eyes peeled in 2015. After an hour and a half or so at the picnic the Tweeders were gently roused from their various slumbers and reveries and the caravan once more took to the roads for the final, short part of the route. After the quietness of Russell Square, the noise of Roseberry Avenue and the complex navigation through Exmouth Market made sure that everyone was wide awake for the final run down to St James’ church crypt behind Clerkenwell Green. With the weather still holding very fair, most Tweeders brought the glass of royal-warranted Pol Roger champagne that met their arrival back out into the churchyard where they draped themselves elegantly amongst the trees, or retired across the road to the nearest hostelry – The Three Kings – for glasses of Pimms or pints of bitter, including a first outing for Timothy Taylor’s Tour de France tipple Champion, which found favour amongst the real ale acolytes on the Run. The traditional prizes were adjudged and awarded, though as so few had stayed down in the crypt, some were held over for announcement by email after the event. I’m pleased to say that the 1872 Penny-farthing that I had tried out earlier won Best Vintage Bike. Best Decorated Bike was won by a tweed-wrapped Boris Bike, whilst my fellow marshall Andrea Woelke took the Best Moustache Prize. Rachel and Rima heartily agreed with the award for Best Dressed Lady going to Adriana Seabright-Mills, who was decked out in an amazingly sophisticated lemon yellow outfit, whilst Mikhail Korausch was Most Dapper Chap in a vibrant three-piece suit. Towards the end of the afternoon at The Three Kings the remaining marshall’s had an impromptu photo and also received unsolicited thanks from many members. It was a shame we didn’t get a chance to get a proper one of all of us at the outset as we had done in 2013 but looking after the Tweedrunner’s bikes was far more important. 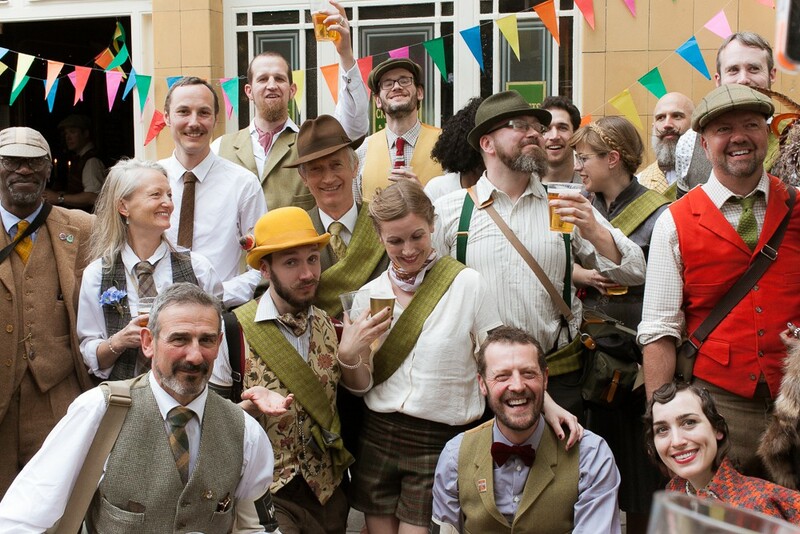 Hopefully the many photos on the Tweed Run’s Facebook page will help me remember all my co-marshall’s from this year. At the pub I got chatting to a couple of chaps (it really doesn’t befit to use the word ‘guys’ when speaking of the Tweed Run) from the Pashley Guv’nor owner’s club, The Guv’nor’s Assembly, which was very well represented on the run. Ian Chisholm had brought his Guv’nor down from York whilst Dave Clarke had come across from Brentford. Both were full of praise for the organising team. 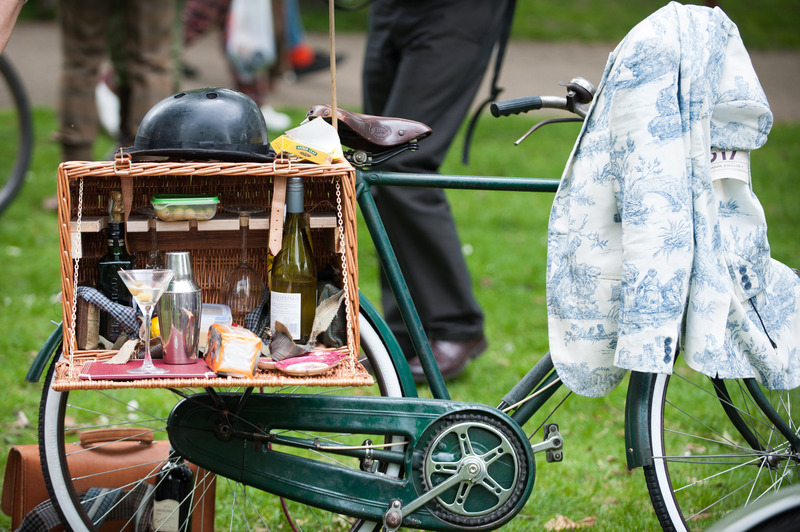 What I really love about The Tweed Run is that, though it ostensibly harks back to eras of much greater social and class divide, it’s actually the most inclusive ride I know. The male – female ratio is pretty much bang on 50-50; attendeess genuinely range from 8months to 80years old; they come from all races, religions and political backgrounds. And I would wager a gineau or two that you won’t find a more friendly bunch of strangers anywhere in the world. As the afternoon wore on and the tweed thinned out we too realised it was time to bid farewell to the remaining members of this happy group. Having enjoyed more than a couple of drinks at the end of the ride we walked our bikes over to nearby Farringdon Station and caught the train back to Blackheath where we basked in the afterglow of a truly wonderful day out on a bike. 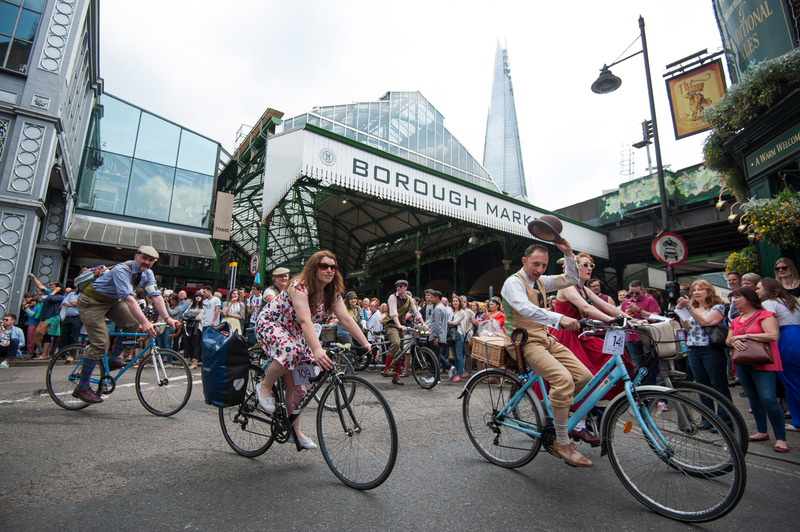 This entry was posted in London, Ride Reports, Style and tagged bloomsbury, Cycling, lfgss, London, space4cycling, tailoring, tweed, tweed run. Bookmark the permalink.